This is another of the things we have found down a microscope in one of our undergraduate practicals, but for once it’s not a ciliate. This is the larva of a parasitic fluke called Bucephalus, which is the Greek for ‘bull headed’. 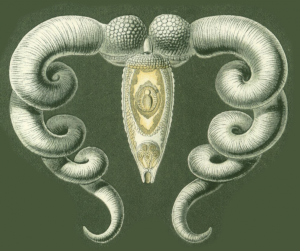 It’s appropriate for this fluke not because it looks like Alexander the Great’s horse, but because its two “tails” (furcae) look like horns when they are fully extended. Two of these hosts – the clams and sea-bass – are economically important sea foods. 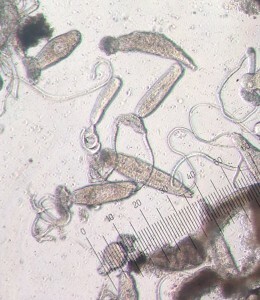 Like many flukes, the larval stages in the first intermediate host – the clam – chemically castrate the host so that it diverts more resources to the survival and propagation of the parasitic fluke than it does to its own. 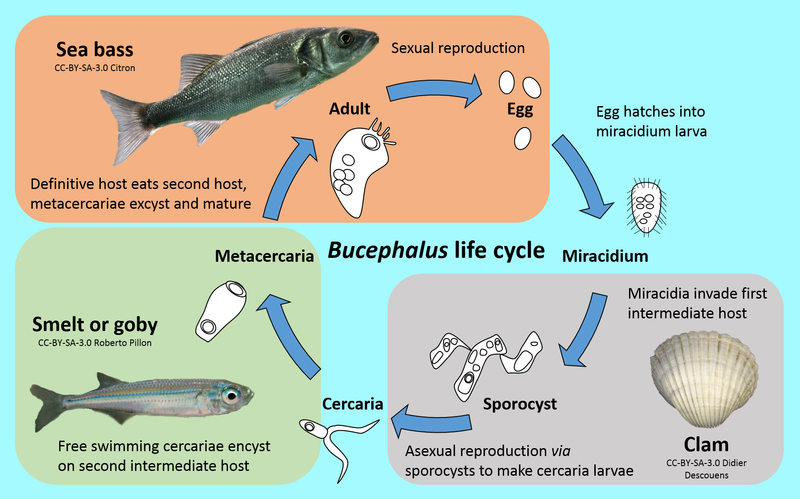 In the sea bass – the definitive host, where the fluke reproduces sexually – the adults are found in the fish’s gut, and heavy infections cause weight loss in both wild and farmed fish. Although Bucephalus cannot infect humans, we are the definitive host for several other flukes, most importantly the liver fluke, the Chinese liver fluke, the intestinal fluke, and the blood fluke that causes schistosomiasis (bilharzia). These have similarly complicated life cycles involving molluscs and assorted other intermediate hosts, and between them they infect many tens of millions of people worldwide. Drug treatment options for fluke diseases tend to be limited and have unpleasant side effects, and schistosomiasis in particular is on the WHO list of neglected tropical diseases, for the damning ratio of infections in the developing world to investment made by the developed world in its treatment and prevention. It really is about time this changed.